When I went into Starbucks, which was for a break on a busy Bank Holiday Monday, I was quite intrigued to see some new tea drinks. They have launched a range of Starbucks Tea Lattes, one of which is a Matcha Latte, which is one of my favourite drinks in the Japanese restaurant we go to. It is made with hot milk and Matcha powder, and is a delicious finish to the meal. 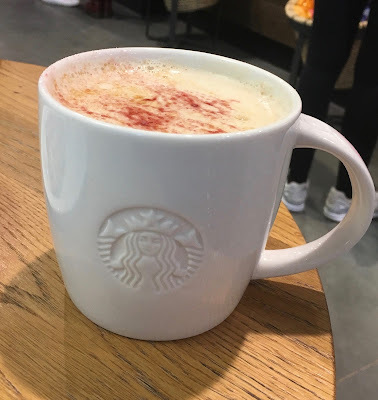 However I was on the quest to try something new, so another drink that caught my eye was the Starbucks Red Apple Rooibos Latte and that is what I decided to order. The drink was served in a nice mug with a dusting of delicious apple blossom topping decorating the top. I enjoyed the flavour of the latte. I think I had been worried that this would be one of the novelty over sweet and indulgent drinks from Starbucks, but this was far from it. The flavour was quite subdued, the apple was rich but very gentle on the sweetness and the Rooibos tea blended with it perfectly. I thought the two flavours went together impressively well, and managed to be both refreshing and soothing, the apple just shined through just enough. I was pleased with my choice of drink, and it is one I will go back for, but I’ll be trying the Match Latte next.